One of the standard applications for demonstrating accuracy of electromagnetic (EM) codes in radar cross section (RCS) analysis is simulation of scattering from spheres made of perfect electric conductor (PEC). This application note demonstrates calculations of bistatic EM wave scattering from the electrically large PEC spheres 15 GHz using WIPL-D software. 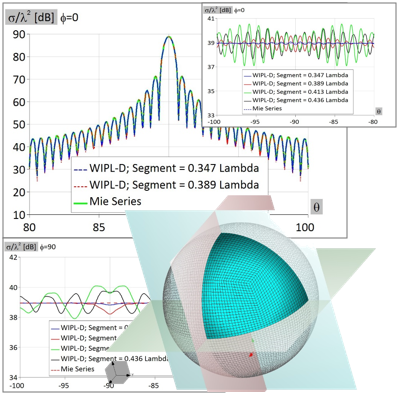 Four models of PEC spheres were created and simulated using WIPL-D simulation software. The radius of the spheres was 50 wavelengths. The spheres of such a radius can be considered as electrically large objects (scatterers). The spheres are illuminated using EM plane wave. In order to decrease simulation time and number of unknowns, EM models of PEC spheres were simulated after applying three symmetry planes. The results obtained after utilization of WIPL-D Pro, a 3D EM simulation software, are compared with results obtained by using Mie series. Lorentz-Mie series is the standard benchmark result used in case of accuracy demonstration and it is based on analytical solution for canonical geometries. On the other hand, exploited simulation software, WIPL-D Pro, is a full wave 3D EM Method-of-Moments (MoM) based solver which uses HOBFs (higher order basis functions). The software environment is used be used both, for modeling and simulation of the spheres. In addition, the matrix inversion computations are performed using WIPL-D GPU Solver, a WIPL-D add on tool. Comparing to some other volume-discretization based computational methods, with WIPL-D, volume discretization is not required. Also, the artificial boundaries like radiation boxes or perfectly matched layers are not required. All of these features contribute to the high accuracy and efficiency of the computations and make the method especially suitable for open-space problems, such is RCS calculation. 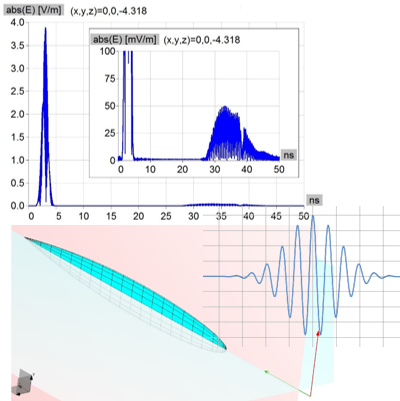 In this application note, simulation of the Radar Cross Section (RCS) in time-domain is described in WIPL-D Software suite. The products used are WIPL-D Pro and WIPL-D Time Domain Solver. Well known metallic object NASA almond was illuminated by plane wave using Gaussian modulated sine. Near field results in time domain are shown. Object is about 60 wavelengths long, about 4 wavelengths high and about 0.2 wavelengths thin. Polarization is parallel to the longer semi axes of the almond’s cross section. Two symmetry planes are used in order to reduce required number of unknowns for current approximation. It is made using pre-defined object named BoR (Body of Rotation). Simulation is performed on the inexpensive desktop machine (any regular desktop or laptop will do). One can conclude that WIPL-D Time-Domain Solver combined with extremely efficient MoM solver WIPL-D Pro is very applicable for the time domain simulation. Simulation time is measured in minutes for over 100 frequency points. 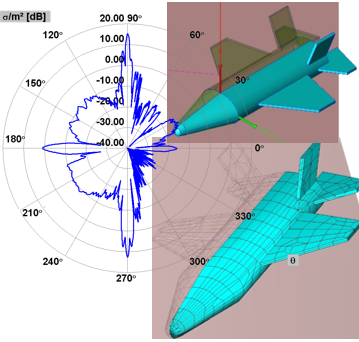 This paper presents modeling and simulation results of monostatic Radar Cross Section (RCS) for scaled model of generic airplane in WIPL-D software. We present simulation times, memory requirements and hardware used for two types of solvers: CPU and GPU. The airplane is modeled from the sketch in WIPL-D Pro CAD which provides simple and fast solid modeling of complex geometries using built-in primitives, Boolean operations and other features. Length of the model is 310 mm. The simulation was performed in WIPL-D Pro at frequency of 30 GHz. The model is simulated using both CPU and GPU solvers. CPU solution has been prominent feature of WIPL-D software for many years, but last several years the GPU technology has been flagship product for large scale examples. The PC used for simulation is a regular configuration, rather than an expensive workstation, with simulation time measured in minutes. 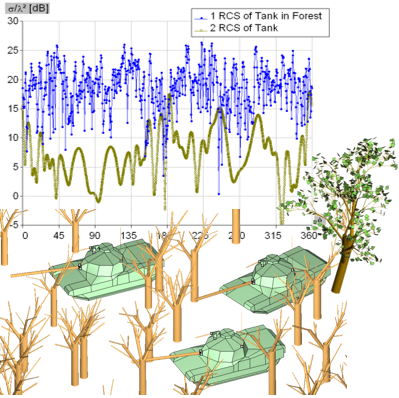 Scattering of EM waves from trees and foliage as well as the propagation of EM waves in the presence of forests plays an important role in many civil and military applications (such as Foliage Penetrating Radar for detecting potential targets in the forest). Computationally efficient modeling of trees and foliage can be done with metallic wires for branches and metallic plates for leaves with distributed loadings over them. The approach is valid up to approximately 150 MHz (considering that the tree trunk has diameter less than about 2 ft / 60 cm). The number of unknowns needed for the simulation is reduced approximately 100 times! Only ~100 unknowns are needed for the modeling of a single tree. On a standard desktop, the simulation of the entire forest with 100 randomly placed trees and additional objects lasts under a minute. The presented approach opens the possibility for a rapid full 3D EM simulation of complex sceneries involving trees, foliage, and potential targets inside forests.